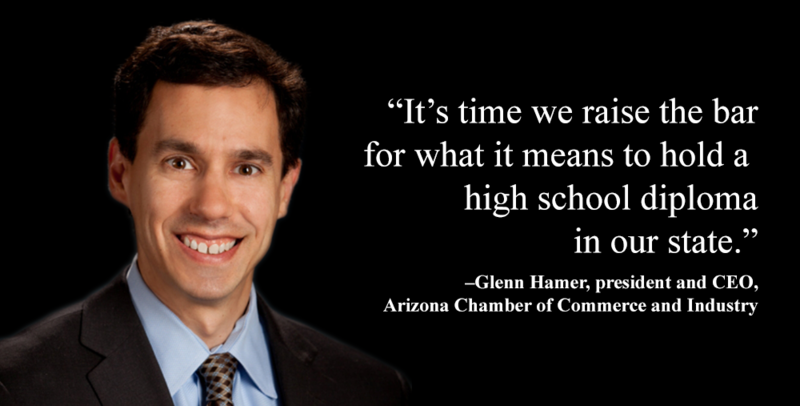 Arizona legislators who have served on House and Senate education committees said they will work together to solve the budget shortfall, support settling the school inflation funding lawsuit and expect more attempts this session to try to repeal Arizona’s College and Career Ready Standards. 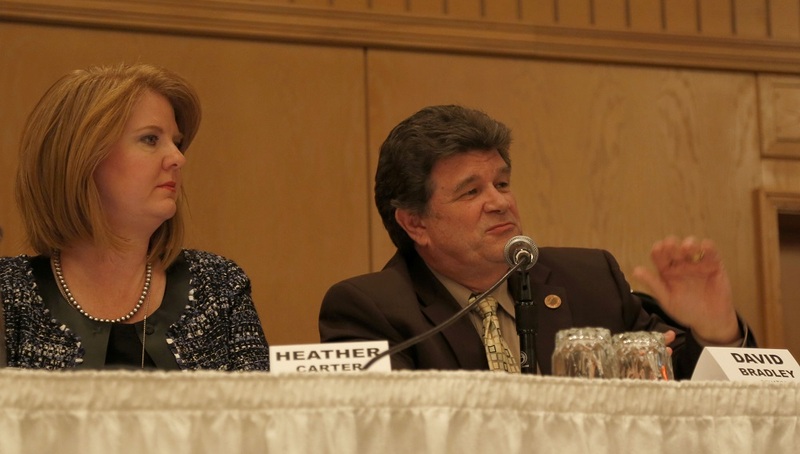 During a mid-November panel moderated by Dennis Welch, political editor for 3TV and co-host of Politics Unplugged, the legislators said they were waiting to hear if they would continue to serve as education committee members. 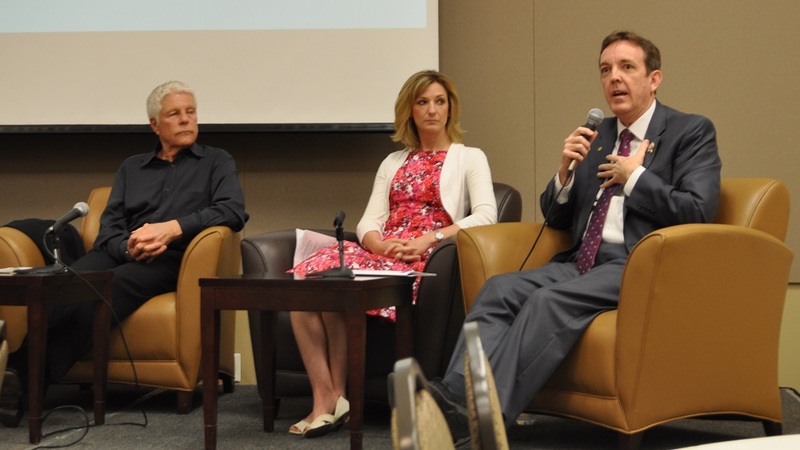 The discussion was part of a legislative workshop hosted by three of Arizona’s leading public education groups – Arizona School Boards Association, Arizona Association of School Business Officials, and Arizona School Administrators. The last six years have been tough on education funding, said Rep. Eric Meyer, (D-28), the newly-elected House minority leader who has served on the House education committee for the past six years. “We are in a situation here that looks a tad bleak, but you cannot give up. You cannot say every circumstance is against us. We have to fight to make this work,” said Sen. David Bradley (D-1), president pro tempore of the Senate and an education committee member for years. Sen. Carlyle Begay (D-7), who has served on the Senate education committee, discusses education during a legislative workshop in mid-November. Educators and school district leaders should reach out to their legislators now with their concerns before the session starts, said Rep. Heather Carter (R-15), a House education committee member for years who is a clinical associate professor at Arizona State University’s Mary Lou Fulton Teachers College. Rep. Doug Coleman (R-16), who has served as House education committee vice chair and taught at Apache Junction High School for years, said he’s concerned about how people view education. When Welch asked panel members what the biggest issue will be this year at the Legislature, they all agreed it is the budget. 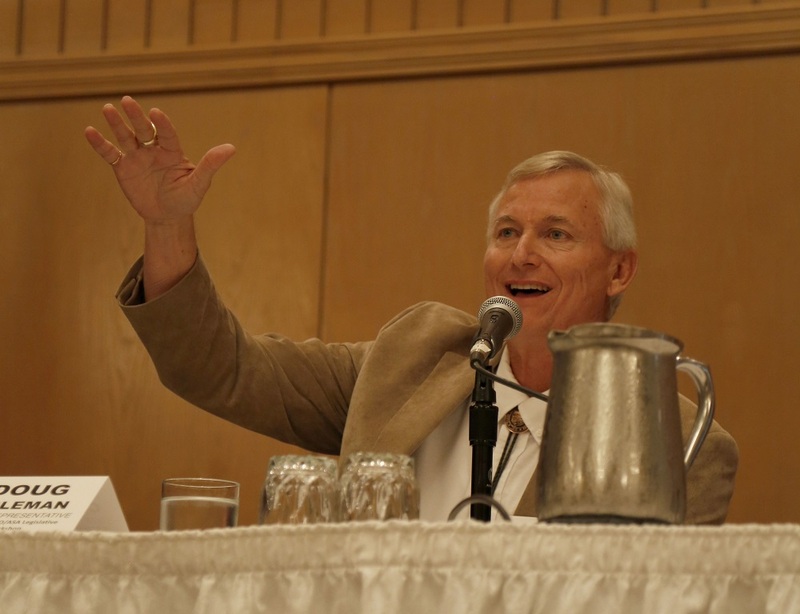 Dennis Welch, political editor for 3TV and co-host of Politics Unplugged, moderated the panel of Arizona legislators. The Joint Legislative Budget Committee’s forecast of a $520 million budget shortfall in 2015 and a $1 billion shortfall in 2016 isn’t what was anticipated, Begaye said. What are some of the options for solving the shortfall? It may be helpful to delay implementing the corporate tax credits approved over the past few years, Begay and Coleman said. Rep. Doug Coleman (R-16), who has served as House education committee vice chair, during the panel discussion. Carter and Coleman said they don’t think the Legislature will support a tax increase. 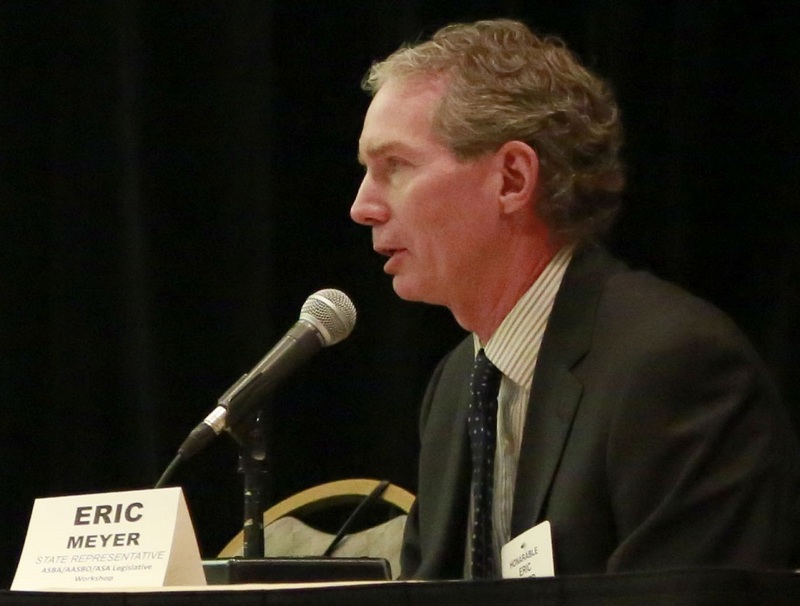 Meyer said he is concerned that eliminating state income taxes as Governor-Elect Doug Ducey suggested during his campaign. That would take $4.5 billion in revenue from the state budgets – “that’s exactly what we spend on our schools in this state. I don’t think that’s a viable plan moving forward,” Meyer said. While Coleman said he knows everything is on the table, he said he hopes that education is spared more cuts. Education leaders at the legislative workshop. A bipartisan coalition would help in preventing further cuts to K-12 education, Meyer said. There is also concern that universities and community colleges do not bear the brunt of more cuts, Meyer said. Rep. Eric Meyer, (D-28) is the newly-elected House minority leader and has served on the House education committee for the past six years. “We made the largest cuts to those systems and had the largest tuition increases in the country here,” Meyer said. All panel members said the state needs to settle the public school inflation funding lawsuit and come up with a feasible payment plan. 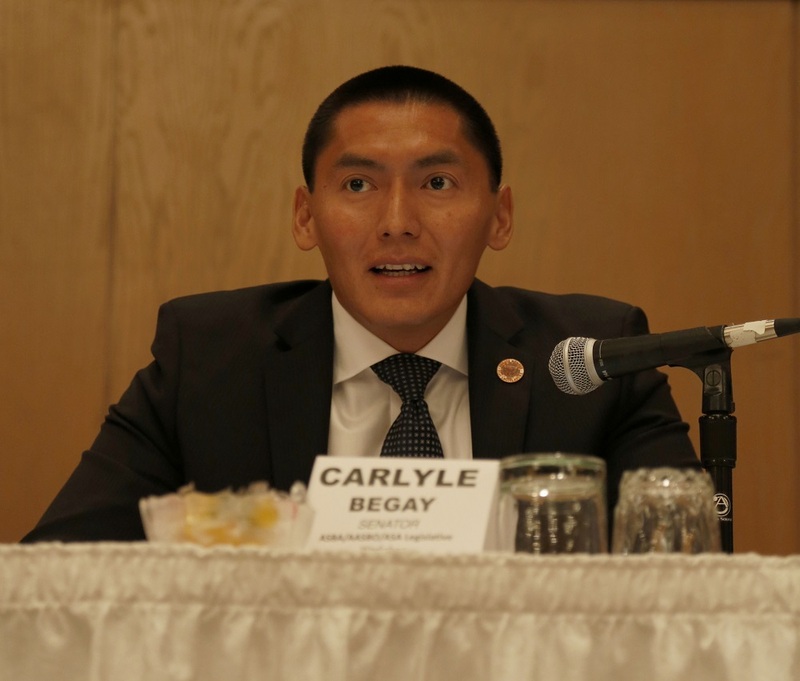 Also, the Legislature needs to “prioritize the new funding that no doubt will be invested in education,” and make sure they are “investments that pay off in the long run” Begay said. If there’s not going to be any talk about new funding sources, then there’s going to be talks about cuts, Bradley said. He sees an either-or scenario shaping up: either talk about new funding sources or talk about cuts. “We talk a lot in the legislature about freedom and choice. I like to talk about responsibility and consequence,” Bradley said. Cuts mean no expansions in empowerment scholarships, tax credits for donations to public schools and student tuition organizations, charter school capital projects and funds to reduce charter schools’ waiting lists this year, Bradley said. People need to watch how their legislators vote on education issues and hold them responsible, Coleman said. Carter said she thinks more funding decisions are made locally through bonds and overrides. “You’re going to see more of that out in the landscape in terms of what we’re asking voters to do in terms of funding schools, Carter said. Yet, when districts have cut over $50 million from their budgets in the past several years, “a 15 percent override doesn’t begin to restore even half of those cuts. It helps us, but it doesn’t get us out of the massive hole we’re in,” Meyer said. Financial needs continue to increase despite upswings in some areas, and the gap between richer and poorer school districts continues to grow, Bradley said. The panelists said there may be more attempts this session to repeal Arizona’s College and Career Ready Standards after unsuccessful efforts last year. When people talk about getting rid of the standards and starting over again “that is an expensive proposition,” Bradley said. “I honestly think in the Senate, at least, that there is a coalition among both the minority and some members of the majority to squelch that (efforts to repeal the standards), stop it or change it so its impact will be minimal,” Bradley said. Meyer said he knows there will be discussion about the standards. “The question is whether we will continue down the path that our universities, business leaders, communities and teachers in most cases have supported with moving forward with so we can compare Arizona with other states to know how we’re doing, and whether the votes are there to get the bills out of the House and the Senate to the Governor’s office,” Meyer said. 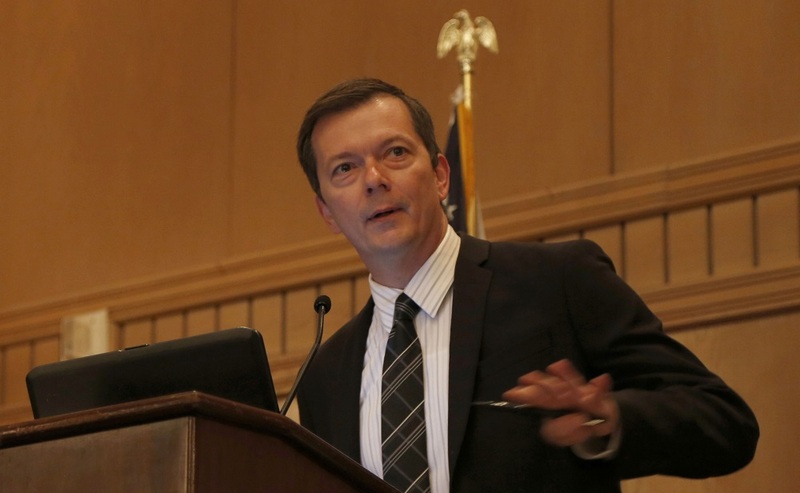 Perceptions about the standards often differ greatly from what the standards are, and people questioning what they’ve heard seek reliable information to answer their questions, Coleman said. Many schools have met with parents and community members about the standards to talk about what students should master at each grade level and how that will better prepare them for college and career, Carter said. Carter said when she reads the standards to them, such as “Will be able to count to 100,” there’s not a lot of argument about learning that. Begay said he is concerned about the new AzMERIT test that students in third through eleventh grades will take for the first time in spring 2015. “One of the priorities I’ve heard so far from teachers, is we need help with curriculum development and that’s a focus that many schools are aware of,” Begay said. When Carter talks to Ducey, she said she will ask him to settle the education funding lawsuit and to protect the work the Legislature did to solve the healthcare issue. “If I did get to talk to him, there are some funding issues going on in education and I think we need to look at the entire process for public, charter and district schools,” Coleman said. Bradley said he’d like to talk with the governor about how to reinforce and fund the relationship between students and teachers that is so important to students’ success. Begay said he appreciates the governor-elect’s willingness to listen and learn.